April has been a busy month. 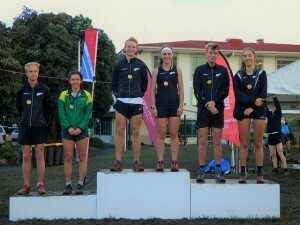 The announcement of the JWOC team following the trials in late March, the Oceania Championships – with excellent NZL results, followed by the announcement of the team for WOC, the Schools Test Match, and culminating in a highly successful WMOC2017. Hard to know where to start, so pick and choose from what is below as you wish! The team will be managed by Karen Beckman, with a coach to be appointed in the very near future, although John Robertson is acting as pre-JWOC coach and helping with training programmes and planning. All the selected athletes will run in sprint, middle, long and relay. The women for the sprint Relay will be decided after the individual sprint. Congratulations in particular to Tommy in being selected in both teams. Hopefully an appearance in the WOC Sprint can be a springboard to success as JWOC a week later. The 2017 Oceania Championships began on Good Friday with the sprint held on the Carrington campus of UNITECH. In M21E Ross Morrison followed up his win in the sprint at the World Games/JWOC trials with a 10 second victory over surprise 2nd placegetter Cameron Tier, with Simon Uphill of Australia only 1 second behind Cameron. Cameron led through the first 5 controls before Ross took the lead and never relinquished. Nick Hann and Gene Beveridge filled the next two places only seconds behind Simon but well in front of 6th place. In W21E Charlotte Watson of GBR, but currently living in Canberra, had a convincing victory over Liis Johanson of Australia with Imogene Scott being the first Kiwi, and the only one in the 6, in 3rd place. In M20 Tommy Hayes and Devon Beckman had a real tussle with Tommy emerging the winner by the smallest of margins. There was a gap of over a minute back to Cameron de L’Isle in third, and despite the presence of a strong Australian contingent, 7 Kiwis in the top 10. In contrast, Alice Tilley was a convincing winner of W20 by 50s over Kayla Fairbairn with Australia’s Asha Steer in 3rd place. The M and W 20’s on the sprint podium. Photo: Thomas Stolberger. M21E 3.6km: 1. Ross Morrison (HB) 15:39, 2. Cameron Tier (NW) 15:49, 3. Simon Uphill (AUS) 15:50, 4. Nick Hann (PAPO) 15:52, 5. Gene Beveridge (NW) 15:53, 6. Brodie Nankervis (AUS) 16:33. W21E 3.1k: 1. Charlotte Watson (GBR) 15:24, 2 Liis Johanson (AUS) 15:40, 3 Imogene Scott (NL) 15:42, 4 Susen Lösch (GER) 15:50, 5= Belinda Lawford (AUS) 15:58, 5= Natasha Key (AUS) 15:58. M20 3.6k: 1. Tommy Hayes (AK) 15:59, 2. Devon Beckman (HB) 16:00, 3. Cameron de L’Isle (NW) 17:10, 4. Simeon Burrill (AUS) 17:21, 5. Callum Herries (HB) 17:29, 6. Florian Attinger (SUI) 17:30. W20 3.1k: 1. Alice Tilley (NW) 16:52, 2. Kayla Fairbairn (NW) 17:42, 3. Asha Steer (AUS) 17:49, 4=. Winnie Oakhill (AUS) 17:50, 4=. Lara Molloy (WN) 17:50, 6. Heidi Stolberger (NW) 18:00. Saturday’s long distance had special significance (as did the middle distance on Easter Monday) as the Oceania titles in M and W21E carried direct entry into this year’s World Championships. The area, Rototoa, was very untypical for Woodhill Forest with some relatively bland areas of low visibility cutty grass leading into a complex finish section in native manuka. 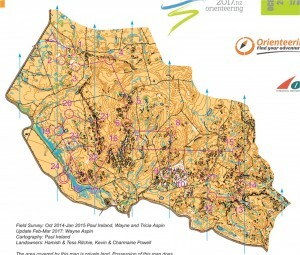 It was in this last section that Imogene Scott missed out on being Oceania Champion, leading after 20 of the 24 controls a mistake on number 23 pushed her not only behind Jo Allison for the Oceania title and the WOC place, but also behind Susen Lösch of Germany. Penny Kane was the second NZL athlete in 6th place. There were no such problems for Gene Beveridge in M21E who, although he could not boast a clean race, still had a comfortable 2 and half minute margin over Matt Ogden, with Simon Uphill again the top Aussie. 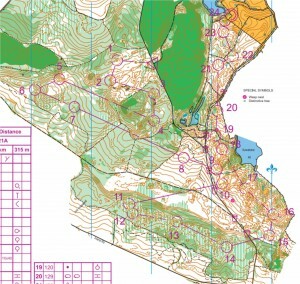 Gene’s win therefore gives NZL three spots in the WOC long distance in Estonia. Left: Rototoa – adjacent to the arena at Oceania Long. Right: Cameron Tier in the finish chute. Photos: Thomas Stolberger. In the junior grades there were excellent wins for Cameron de L’Isle and Lara Molloy. Cameron headed Swiss JWOC representative Florian Attinger by only 50s, with devon Beckman filling 3rd place. 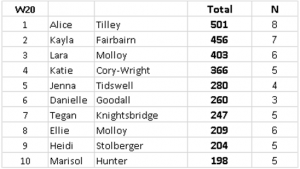 Lara on the other hand had nearly a 5 minute margin over Kayla Fairbairn and another 8 over 3rd place Alice Tilley. M21E 13.2k: 1. Gene Beveridge 1:31:49, 2. Matt Ogden (NW) 1:34:12, 3. Simon Uphill 1:36:45, 4. Chris Forne (PAPO) 1:39:48, 5. Matthew Crane (AUS) 1:46:30, 6. Cameron Tier 1:49:51. W21E 8.1k: 1. Jo Allison (AUS) 1:22:27, 2. Susen Lösch 1:22:54, 3. Imogene Scott 1:23:28, 4. Krystal Neumann (AUS) 1:23:40, 5. 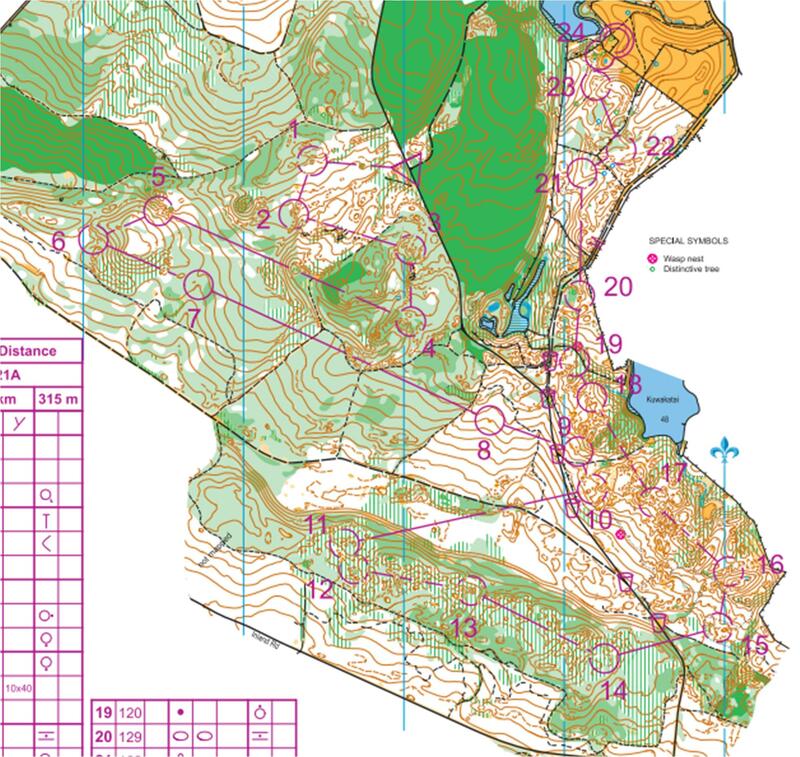 Natasha Key 1:25:11, 6. Penny Kane (BOP) 1:25:58. M20 8.7k: 1 Cameron de L’Isle 1:10:01, 2. Florian Attinger 1:10:51, 3. Devon Beckman 1:12:25, 4. Nick Smith (PAPO) 1:16:09, 5. Tommy Hayes 1:16:33, 6. Callum Herries 1:18:24. W20 5.8k: 1 Lara Molloy 1:13:49, 2. Kayla Fairbairn 1:18:27, 3. Alice Tilley 1:26:25, 4. Winnie Oakhill 1:27:37, 5. Georgia Jones (AUS) 1:28:50, 6. Heidi Stolberger 1:30:16. 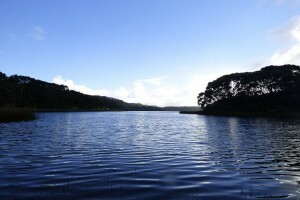 On Easter Sunday attention turned to the Oceania Relays at Lake Kerata, another lovely location adjacent to the sand dune lakes of northern Woodhill. Here the main focus was on the New Zealand and Australian teams in the ANZ Challenge and Pinestars-Bushrangers Test Match at both elite and junior level. In M21 there was a straight 1-2 for NZL with the ‘A’ team of Gene Beveridge, Matt Ogden and Nick Hann never being headed and running out winners by over 10 minutes. The ‘B’ NZL team of Ross Morrison, Tom Reynolds and Chris Forne also took out the top Aussie team, although only by 9s with Chris catching and passing Matt Crane on the last leg. It was a different story in W21 with the Australian trio of Natasha Key, Belinda Lawford and Jo Allison proving too strong for their NZL counterparts of Imogene Scott, Renee Beveridge and Georgia Whitla. The same was true in W20 where AUS took first place 10 minutes ahead of the first NZL team and a further 14 minutes back to the second NZL trio. New Zealand were convincing winners in M20 though with Tommy Hayes, Ed Cory-Wright and Devon Beckman also having a 10 minute winning margin. M21: 1. NZL (Gene Beveridge, Matt Ogden, Nick Hann) 1:51:06, 2. NZL (Ross Morrison, Tom Reynolds, Chris Forne) 2:01:44, 3. AUS (Simon Uphill, Ian Lawford, Matt Crane) 2:01:53. W21: 1. AUS (Natasha Key, Belinda Lawford, Jo Allison) 1:58:41, 2. NZL (Imogene Scott, Renee Beveridge, Georgia Whitla) 2:04:46, 3. AUS (Krystal Neumann, Lanita Steer, Bridget Anderson) 2:06:08. M20: 1. NZL (Tommy Hayes, Ed Cory-Wright, Devon Beckman) 1:44:40, 2. NZL (Cameron de L’Isle, Stephen Harding, Nick Smith) 1:47:54, 3. AUS (Toby Wilson, Joseph Dickinson, Jarrah Day) 1:47:57. W20: 1. AUS (Zoe Dowling, Winnie Oakhill, Asha Steer) 1:50:11, 2. NZL (Kayla Fairbairn, Lara Molloy, Alice Tilley) 2:00:33, 3. NZL (Heidi Stolberger, Ellie Molloy, Anna Parsons) 2:14:30.
of Natasha Key in 4th. In M20 Stephen Harding had probably his best ever result with a clear win over Devon Beckman who for the third time had to settle for a minor placing. Lara Molloy backed up her win in the long distance with another strong run to take out W20. M21E 4.9k: 1 Nick Hann (PAPO) 36:11, 2. Matt Ogden 36:13, 3. Simon Uppill 37:36, 4. Ross Morrison 38:29, 5. Leon Keely (AUS) 38:55, 6. Matthew Crane 39:23. W21E 4.0k: 1. Charlotte Watson 34:53, 2. Susen Lösch 35:48, 3. Renee Beveridge (NW) 39:45, 4. Natasha Key 39:50, 5. Liis Johanson 41:21, 6. Georgia Whitla (PAPO) 41:28. M20 4.3k: 1. Stephen Harding (PAPO) 34:25, 2. Devon Beckman 35:38, 3=. Tommy Hayes 35:44, 3=. Nick Smith (PAPO) 35:44, 5. Florian Attinger 37:12, 6. Ed Cory-Wright (PAPO) 38:01. W20 3.3k: 1. Lara Molloy 31:24, 2. Zoe Dowling (AUS) 33:23, 3. Kayla Fairbairn 34:09, 4. Alice Tilley 34:30, 5. Asha Steer 36:34, 6. Winnie Oakhill 38:05. M21E: Gene Beveridge (S, L, R, M), Chris Forne (L, R, M), Nick Hann (S, R, M), Ross Morrison (S, L, R, M), Matt Ogden (L, R, M), Tom Reynolds (S, L, R, M), Alistair Richardson(S), Karl Dravitzki (L). W21E: Renee Beveridge (L, R, M), Penny Kane (S, L, R, M), Greta Knarston (L, R, M), Sarah O’Sullivan (S, L, R, M), Imogene Scott (S, L, R, M), Georgia Whitla (S, L, R, M), Jula McMillan (S), Tessa Ramsden (S). M20: Devon Beckman (S, L, R, M), Ed Cory-Wright (S, L, R, M), Cameron de L’Isle (S, L, R, M), Tommy Hayes (S, L, R, M), Nick Smith (L, R, M), Stephen Harding (S, M, R), Callum Harries (S, L). W20: Kayla Fairbairn (S, L, R, M), Ellie Molloy (S, L, M), Lara Molloy (S, L, R, M), Heidi Stolberger (S, L, M), Alice Tilley (S, L, R, M). As can be gauged from the results listed above NZL was the overall winner with 462 points to AUS with 320, winning the sprint by 119-81, the long by 118-81, the relay by 105-80 and the middle by 120-78. Australia’s only successes were in W21E in the sprint, long and relay and in the W20 relay. The Oceania Championships formed round 3 of the 2017 SuperSeries and with only Queen’s Birthday to go and 8 of the 12 individual events to count the leading contenders are now clear. In M21E Gene Beveridge, the only person in this class to have run in all 9 races so far, has had to drop his lowest score but still leads Ross Morrison by 50 points. However, Nick Hann, the 2016 winner, lurks in third place only 10 points behind Ross, and with Queen’s Birthday being based in Christchurch is sure to improve his total. 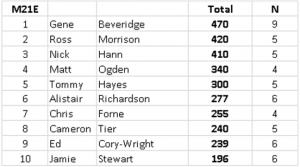 Depending on who from further north turns up, the chances of Alistair Richardson, Chris Forne and Ed Cory-Wright to break into the top 3 cannot be ruled out. 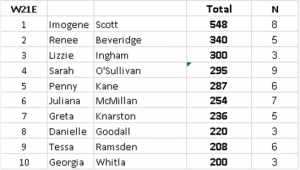 The position in W21E looks a lot clearer and it is unlikely that Imogene Scott, with a lead of nearly 250 points, can be headed. The battle for second looks to be between Renee Beveridge, Sarah O’Sullivan and 2016 winner Penny Kane. M20 presents perhaps the most intriguing battle. 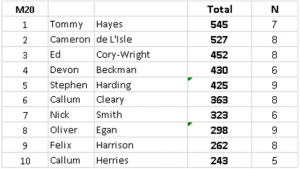 Although Tommy Hayes and Cameron de L’Isle are well clear at present, home ground for Ed Cory-Wright and Stephen Harding may give them a reasonable chance of making up the deficit. Devon Beckman can also not be ruled out. Ultimately it may depend on who, of the three northerners, makes the trip south. To a certain extent the same is true in W20 where the leading three are all students at Auckland University possibly giving local Katie Cory-Wright a chance to move up from 4th place. Unfortunately, having not made the trip south for the first round in Queenstown/Waikaia, last year’s winner Danielle Goodall has been disadvantaged by the grade structure at Oceania and with only 3 races counting is out of the running. As in 2016 there has also been an, admittedly low-key, teams competition with the best 5 individual totals in the 21E classes from each round for each of Northern, central and Southern counting. After the three rounds so far Northern has a nearly 500 point lead over Southern who lead central by about 150 points. Again, with home advantage it will be interesting to see if Southern can make up this deficit in the final round. Following the Oceania Championships the New Zealand-Australia Schools Test Match took place at the Middle Earth events in Rotorua. 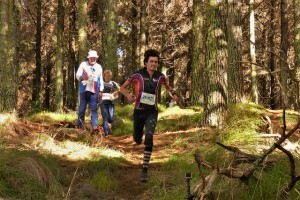 For a visitors perspective the following report comes from Orienteering Australia. “The ANZ Secondary Schools Challenge Trophy has arrived in Australia for the first time since the inception of this Australia New Zealand Challenge in 2005. What a fantastic carnival it was for the more than 50 Australian Secondary School students who took part. A great opportunity to network, make friends and experience the fun of a major international event. Congratulations to the four selected Australian Secondary Schools teams who did so well on the first day holding the NZ side to a 2 all draw and for maintaining their cool on the second day ( a sprint relay) whilst dealing with hot steaming vents and pressure from high performing NZ teams. Sadly, the invalidation of the sprint relay was caused by confusion over control codes between Tom Reynolds, the planner of the individual sprint, and Malcolm Ingham, controller of the sprint relay. We can only apologize for this, but as the Australian article indicates it was in fact only a minor distraction from the excitement of the day. A sprint relay would surely be a welcome inclusion in future Schools’ Test Matches. With the selection of the WOC and JWOC teams there are new additions to the National Squads as selection in these teams is one of the criteria for squad membership. Congratulations therefore to Callum Herries and Jenna Tidswell who have been added to the U23 Squad. The squads now look as follows. With top 3 and top 5 finishes in Oceania also counting for Senior and Under 23 Squad membership respectively there are likely to be other additions in October after the ONZ Championships. Tim Robertson, Laura Robertson and Kate Morrison will run in Round 1 of the 2017 IOF World Cup to be held in Turku, Finland from24-28 May. The competitions include a sprint relay (for which a fourth team member will be found by the organisers), an individual sprint with both qualifying and final, and middle and long distance races. There will no doubt be extensive coverage on World of O (http://worldofo.com/). While home based Kiwis were at Oceania, Laura and Lizzie Ingham ran at the british Easter event the JK, held in southern England. Laura finished 2nd in the sprint with Lizzie 11th. In the middle distance Lizzie was 5th and Laura 9th. Laura bypassed the long distance where Lizzie was 6th giving her 4th place overall. Both also ran in the relay with Lizzie, running in a Halden SK team, finishing 4th and Laura’s Edinburgh Southern team coming in 9th. Lizzie, Kate Morrison and Tim Robertson all ran for their respective European clubs in last weekend’s Tiomila relays near Gothernburg. Lizzie was on the 5th and last leg for the Halden team that came 45th (out of over 300 teams!). Kate was on 3rd leg for OK Linne, finishing 54th, while Tim ran the opening leg of the 10 man men’s relay for Fossum, also finishing in 45th place overall. At the senior end of the HP scale congratulations to all the NZL medal winners at WMOC. In the sprint: Yvette Baker (2nd – W50), Al Cory-Wright (2nd – M50), Ann Scott (2nd – W80), Marquita Gelderman (3rd –W50), Bill Edwards (3rd – M50), Carey Nazzer (3rd – W55). In the long distance: Carey (1st – W55), Karl Dravitzki (2nd – M35), Marquita (2nd – W50), Bill (2nd – M50), Carsten Joergensen (2nd – M45), Greg Flynn (3rd – M35), Ross Brighouse (3rd – M70). For Carey, her gold in the forest came 17years after she took bronze in W40 at WMOC in the Manawatu. Congratulations also to all those who helped make the event happen, and in particular to the many elites, junior elites and other juniors who gave up their time to plan courses, test run courses, turn on controls, man the starts and finishes, water stations etc. etc. Well done to you all.